PUNE: The Kirloskar group is in talks to sell a controlling stake in Kirloskar Oil Engines Ltd, its diesel generator manufacturing business, two people aware of the plan said. Kirloskar Oil Engines, one of the leading businesses of the Pune-based group, makes diesel generators ranging in power output from 5kVA to 3,000kVA. The Kirloskar group was founded in 1888 by Laxman Rao Kirloskar and currently clocks over $3.5 billion in revenue. “The company is currently engaged in talks with a few prospective buyers for the transaction,” one of the two persons cited above said, adding, “a few large private equity funds and strategic buyers have shown initial interest and the talks are centered around valuation.” Both persons spoke on condition of anonymity. Ebitda is short for earnings before interest, tax, depreciation and amortization. Incorporated in 1946, Kirloskar Oil Engines manufactures and services diesel engines (primarily in the range of 2.5 to 740 horsepower) and diesel generator sets. The company has manufacturing units in Pune, Kagal and Nashik (all in Maharashtra), and Rajkot (Gujarat) and caters to the agriculture, power generation, industrial and construction machinery sectors. According to its recent corporate filings for fiscal 2017, Kirloskar Oil Engines’s profit after tax (PAT) was Rs 173 crore on net revenue of Rs 2674 crore, against a PAT of Rs 165 crore on net revenue of Rs 2464 crore in fiscal 2016. Revenue for fiscal 2017 grew 8.5% over the previous fiscal, supported by growth across business segments. In addition, Kirloskar Oil Engines also has a surplus of about Rs1,006 crore as on 31 March 2017. In the domestic market, apart from unorganized players, Kirloskar Oil Engines competes with branded manufacturers such as Cummins India Ltd, Ashok Leyland Ltd and Mahindra & Mahindra Ltd in the medium-range diesel engine segment. 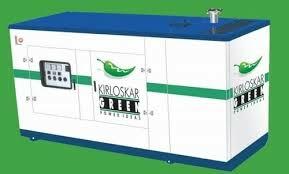 Diesel generator sets manufactured by the company are branded as Kirloskar Oil Engines Green Gensets. Kirloskar Oil Engines Green also offers customised power solutions. In June this year, Kirloskar Oil Engines acquired a majority stake in La-Gajjar Machineries (LGM), the maker of Varuna and Raindrop brands of electric pumps, at a valuation of 7.89 times earnings before interest, taxes, depreciation and amortization. The Kirloskar group also manufactures a wide range of industrial products such as automotive castings, air compressors and air conditioning solutions among others. Another flagship company of the group, Kirloskar Brothers Ltd (KBL), is one of the largest manufacturers of industrial pumps in the country. KBL provides fluid management solutions for large infrastructure projects in the areas of water supply, power plants, irrigation, oil & gas and marine and defence. The company manufactures a range of industrial and petrochemical, agriculture & domestic pumps, valves and hydro turbines. The Kirloskar group is also a minority shareholder in Toyota Kirloskar Motor Pvt. Ltd which manufactures Toyota cars in India.